1 What are mouth ulcers? 2 What causes mouth ulcers? 3 What are the symptoms of mouth ulcers? 5 Can mouth ulcers be Prevented? 6 How are mouth ulcers Treated? Ulcers are painful sores that appear inside the mouth. They are usually red or yellow. They are different from cold sores, which appear on the outer lips and are caused by a virus. 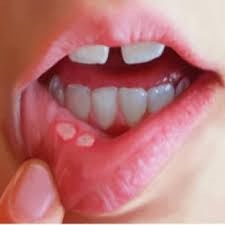 Some cases of complex mouth ulcers are caused by an underlying health condition, such as an impaired immune system; nutritional problems, such as vitamin B-12, zinc, folic acid, or iron deficiency and gastrointestinal tract disease, such as Coeliac disease and Crohn’s disease. When you first quit smoking, you may develop more mouth ulcers than normal, but this is temporary. Some medications, including common pain killers, beta-blockers and some chest pain medicines may cause a reaction that leads to mouth ulcers. A painful sore or sores inside your mouth, on the tongue, soft palate (the back portion of the roof of your mouth), or inside your cheeks. Sores in your mouth that are round, white, or grey in colour, with a red edge or border.